Incredibly, a south side plot holder saw a deer sauntering along the path beside her allotment. She managed to get a short video of the visitation. How the deer made it so far into the city is unknown. What we do know is that the roe deer are solitary for much of the year—this one probably found a route to Warriston along old railway walkways and tunnels from either the Pentland Hills, Corstorphine Hill or more likely, Davidson's Mains/Cramond area where there are healthy populations of this small, attractive species. Roe deer are petit and long-legged. Bucks have short straight antlers, which drop off in winter and grow again by the end of the spring, ready for the August rut, or breeding season. Bucks live alone, except during the rut, when they pair up with small groups of three or four does. 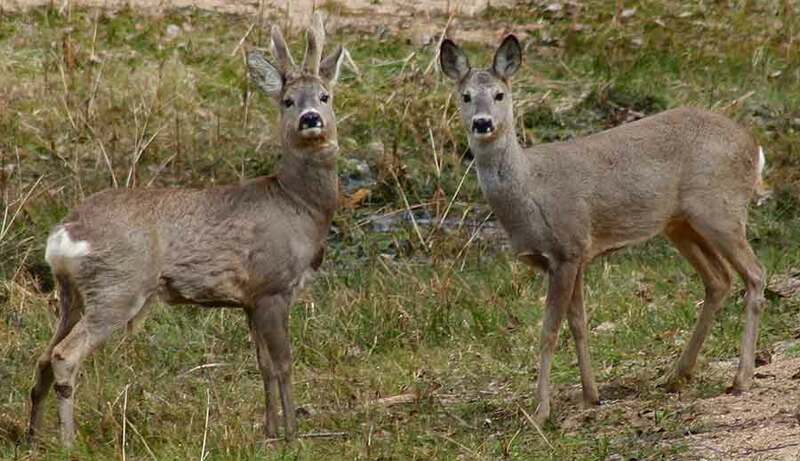 Does give birth to twins the following summer, the only deer species to have a delayed embryo implantation thought to have evolved to avoid territorial conflict with the larger red deer. Following the birth in May/June, the fawns are kept apart for the first week, the doe visiting each twin in turn to feed them. The new borns instinctively stay under cover, relying on their spotted camouflage to keep them safe from predators. They remain with their mother through the winter, after which they separate to live the life of the solitary roe. More general information about roe deer here.